This 1953 Chevy Steering Wheel is a used original GM steering wheel that came from a 1953 Chevy Station Wagon parts car. 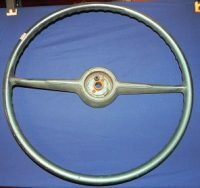 This style steering wheel came on the 150 model cars only and was removed from a 150 Handyman Wagon. 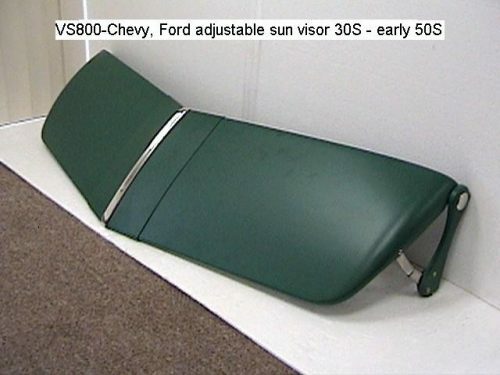 This one is used, is green in color and is in excellent condition. This wheel has some horn parts included but not a complete set. It does have the plastic sleeve (can be seen in the picture) but not the brass spring push button and it does has the cancelling cam on the underside. You can find other horn parts listed separately. Also this style wheel does not work with or come with the chrome horn ring. The horn blows by pushing on the center horn button when all the parts are in place. You will find several different horn buttons listed separately. Important to understand: The plastic reproduction horn buttons sold here and on other websites will not work with this wheel. I will have listed elsewhere in this site the correct horn button for this wheel. On a scale of 1-10 this wheel is a 9.5 All this wheel needs is fresh paint to be a 10.